Slowly the blossom is starting to open up on the tree beyond the sitting room, to watch the seasons come and go as buds form, flowers unfurl, leaves flourish in the summer sun only to turn amber, red and then fall to the graphite grey pavement and that indicates the passing of another year. Now it is the time for the white blossom to form like clouds of shimmering light, the bees will soon swarm around on warm days so many of them that there is a constant hum during daylight hours. 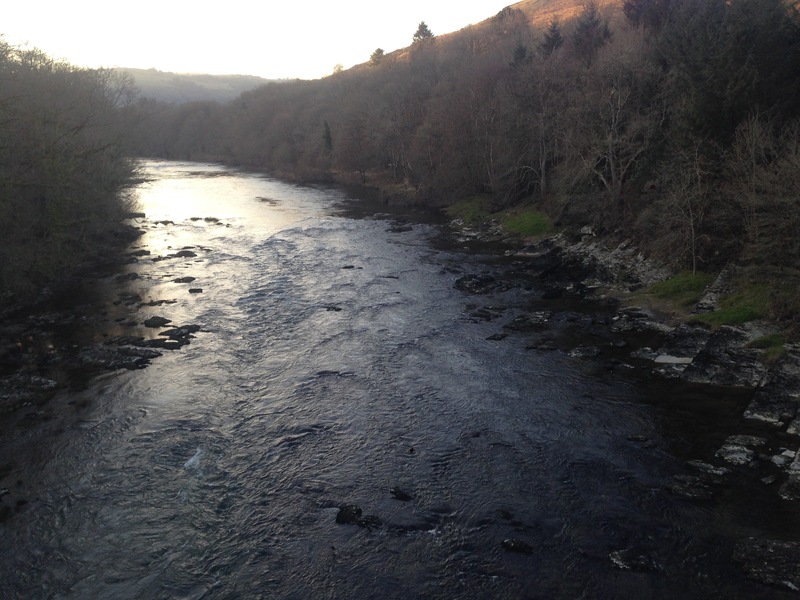 The cold days of March are now behind us and as April heralds in the start of the river trout season it is time to plan a few days out with young Tales. Fishing so far this year has been put on hold because of the state of the rivers, running fast, high and heavily coloured it gave us little chance to fish. We’re not really into managed lakes preferring to chance our luck on meandering rivers however in February we did venture to a small fishery just off the A31 which proved to change our views on such places that when the weather warms up and the coarse season starts again we will return to watch the hot orange paint of the tip of a cork float dip beneath the indego coloured water. 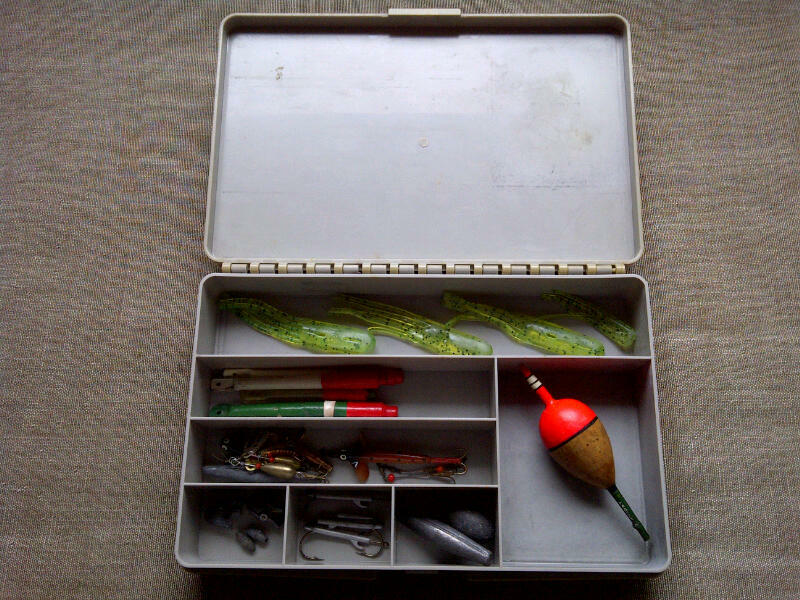 With boxes of game fishing tackle stored in the loft it is now time to get them out, dust off them off and compile sets of tackle for fishing the rivers of Hampshire, Wiltshire and the trickling streams of the West Country. There are Wheatley boxes of nymphs, emergers, drys, wets and the classic Mayfly. Hardy reels with double taper dry lines, sink tips and intermediates – every option is covered with an abundance of spare spools in order to change the presentation quickly. Light tackle to heavier rods and reels for Sea-Trout fishing later in the year…yes, there us a lot of ‘stuff’ as Mrs Tales would point out. For me April is still too early to fish, the bankside vegetation is only just starting to grow, Robins still till the soil for earthworms and grubs and the temperature of the water still too cold for fish to start to feed properly. Those of you that head to the rivers will now doubt find it hard going. The lack of camouflage from the bankside vegitation means that fish are easily spooked with only juvenile fish eager to take the fly more out of their inquisitive nature to chase a moving object, the larger fish are no ‘April Fools’ being tempted by larger patterns they simply tuck themselves close to the bank occasionally moving into mid stream to check out the odd dislodged snail or displaced matter. This month is about planning and preparation, putting the time in now will pay dividends in the months to come. Depending on the enthusiasm of young Tales to venture out fishing we could find ourselves out before the end of the month however I sense it will be May for that first trip to the river. 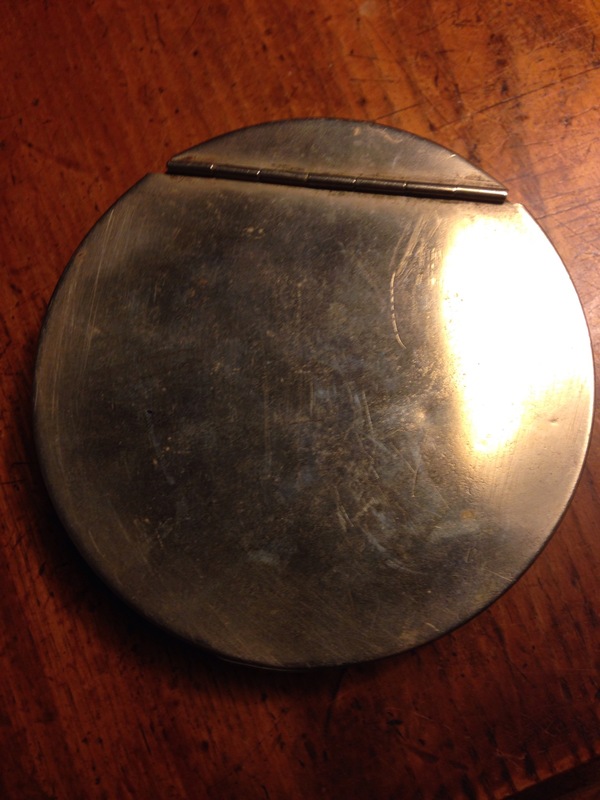 Like the full moon this vintage buckle silver Richard Wheatley cast tin attracted my eye at a table sale in Spitalfields earlier in the year, a £10 note sealed the deal. Inside the tin were several May Flies and Alexander wets. This for sure would make an ideal Christmas present for the fly fisher in your life. I can’t believe that a full two weeks have past since I last updated my blog. In all fairness not much has happened and as work pressures put pay to any fishing before the end of the season for coarse fish we are now upon the start of the season for fly fishing for trout on rivers. 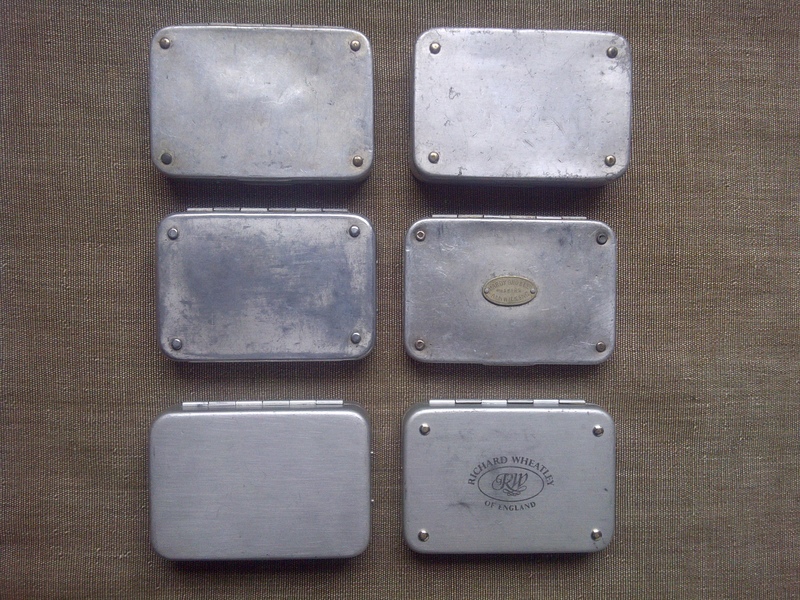 Over the winter months a few items of tackle were purchased and amongst those items were the odd fly box, namely vintage Wheatley alloy boxes and an interesting item for retrieving the odd fly out of overhanging branches. 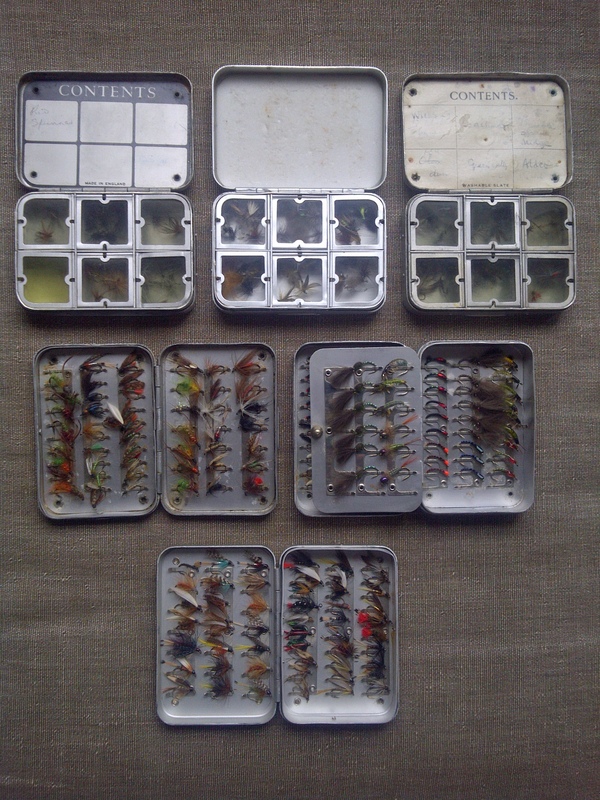 Having had the time to sort all the tackle out into boxes and mark them up accordingly I am further sorting out the fly boxes to contain patterns for the different rivers and locations we fish, well that was my reasoning to justify the acquisition of yet another fly box to Mrs Tales. This latest box made by Wheatley I assume is an early box but it does seem to have the more modern addition of a foam insert to the top of the lid. The compartment have the distinctive yellow celluloid windows however the compartments to the outer edge have oval shaped windows. It would be great to know if this really is an early Wheatley box, so any pointers would be much appreciated. This box will be made up of flies for fishing the river and lakes of The South West and Wales as we may head there over Easter. Most of the flies used for Wales will be classic wets which fill form the contents of another box with clips. In the last edition of Trout & Salmon magazine there was a feature on early season flies, most tied on size 14 hooks and forming a group of emergers. Out of a large collection of flies accumulated over many years I will try to put together a workable selection to cover early season needs for woodland and moorland streams, with a good selection of flies for lakes such as Bala or Tynconel. It would be good to hear from any of you as to your early season choices of fly. With a thud to the doormat a brown Jiffy bag landed containing an Alex Martin alloy lure box. 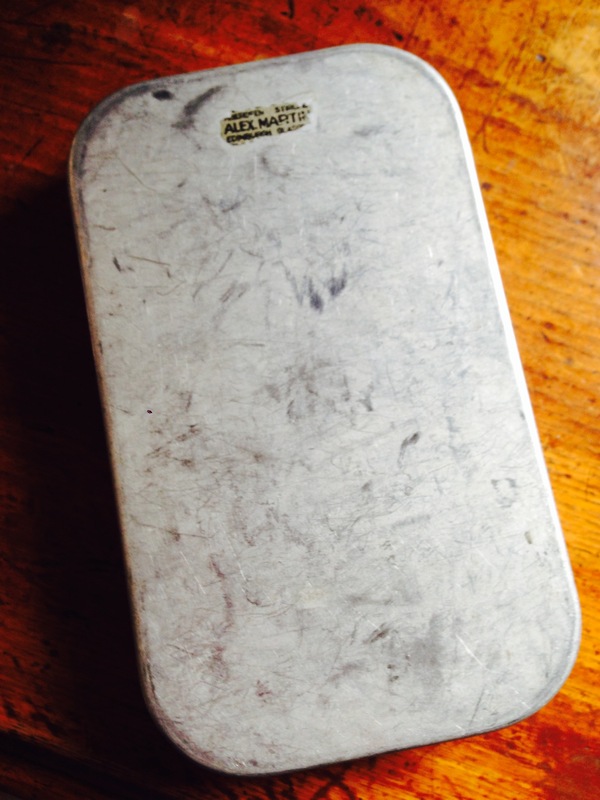 It had all the hallmarks of being made by Wheatley but did not bare any of the distinctive stamping or logo, instead on the underside it had the remains of a transfer stating Alex Martin. 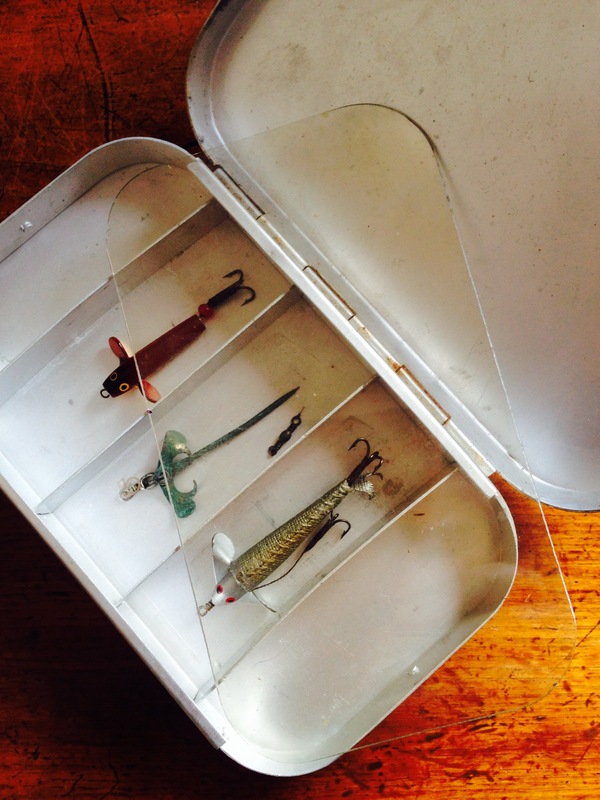 Inside the box was a transparent sheet and beneath two minnow spinners and a mount for a sprat, in what seemed to be unused condition. This box makes a good addition to our collection and will be used. Wheatley make such good quality boxes that they last a lifetime and can be passed down to the next generation, real classics. There had been little time to fish this month and even when the opportunity presented itself the fish weren’t biting. 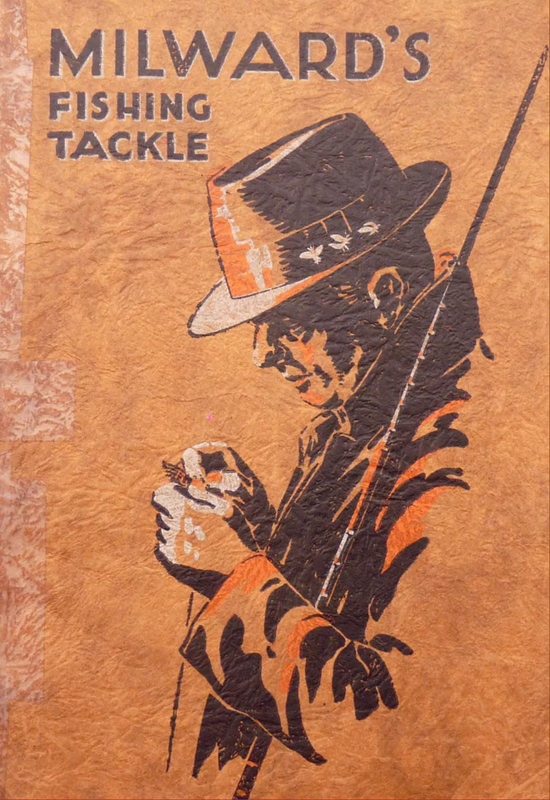 With the official start to the trout fishing season is fast approaching I’m spending time sorting through bags and boxes full of tackle in order to catalogue what I have and what will eventually form the stock for my pending sales of piscatorial vintage items. 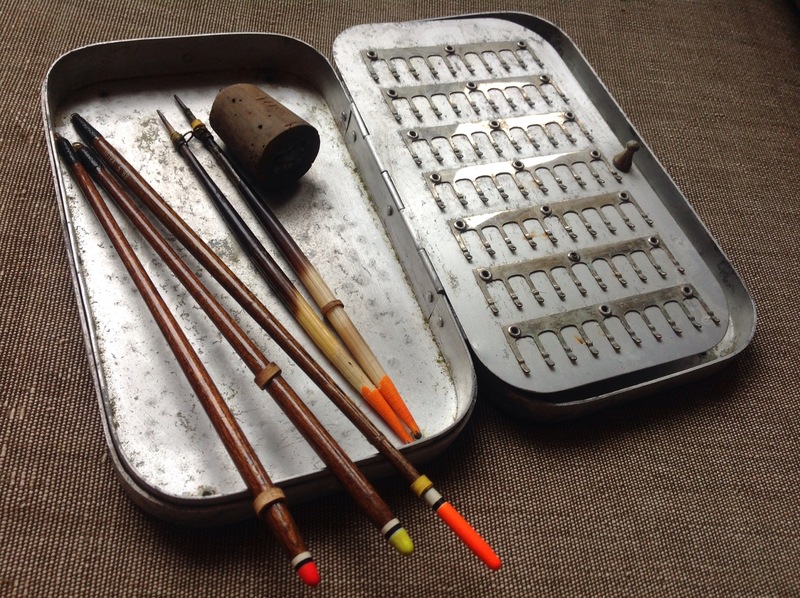 A recent visit to a car boot sale offered up some good finds however in the back streets across the country there seems to be an array of vintage fishing tackle items for sale. 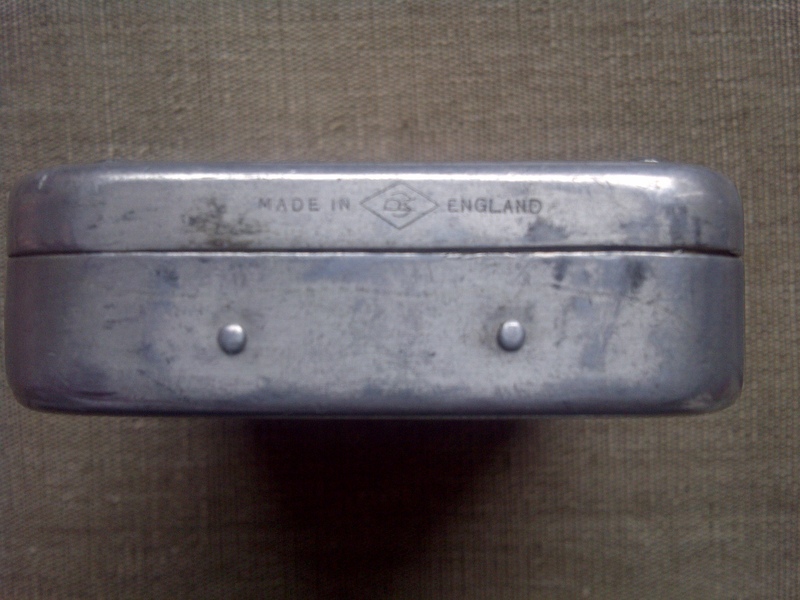 Having never owned one I found two leather line cleaners, one made by Hardy and the other simply stamped ‘Made In England’. In a mixed box of items I found a lead and cork plummet plus three Harcork floats and an ACA car badge. 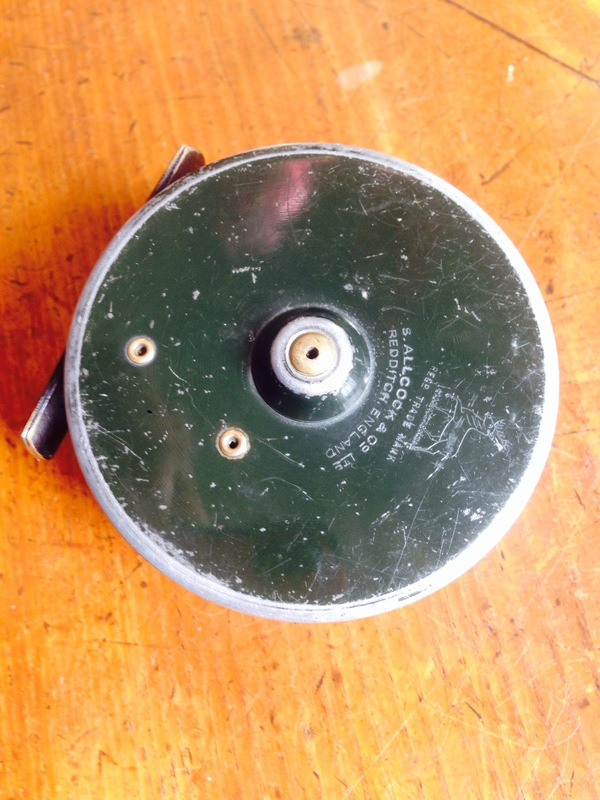 Other good finds were a small Allcocks 3 inch diameter with 2 1/2 inch spool fly reel in its distinctive dark green livery known as Hydraulic Green as it was the same paint as used on the Spitfire, so I guess it dates the reel to the late 30’s to 40’s, the reel still retaining the silk line and from what I can make out an early model that bears no date stamp, I’m struggling to find out what it is, a Condex style reel clearly not a ‘Black Night’ or an early Popular as the reel casing and spool are flat alloy with no surface texture. 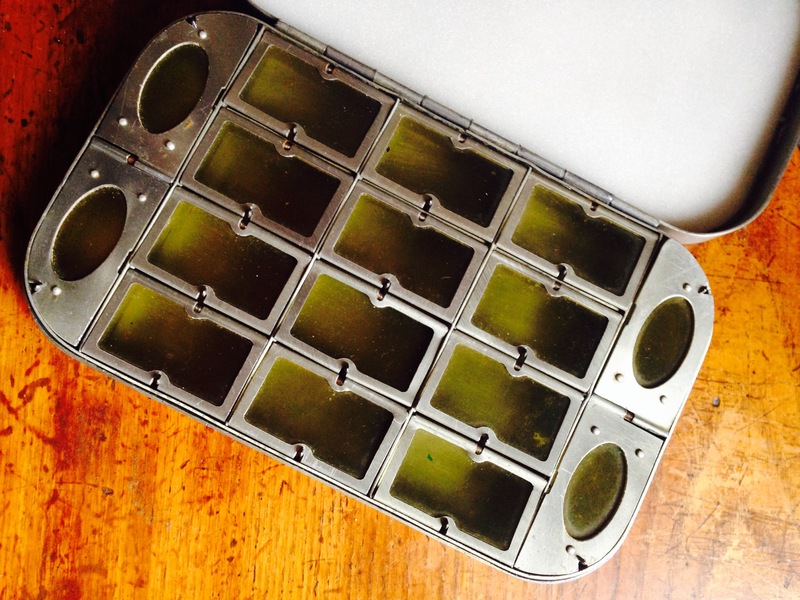 Finally I found an early Wheatley compartment fly box with its ‘Wipe Clean’ printed slate, all great items that will be used this season. It give me no greater pleasure than to give some of these items a new lease of life for them to be used again especially when you realise that if you were to by some of these items as new a small Wheatley six compartment fly box now retails for over £50, so to source, recycle and reuse seems to be the way forward this year. 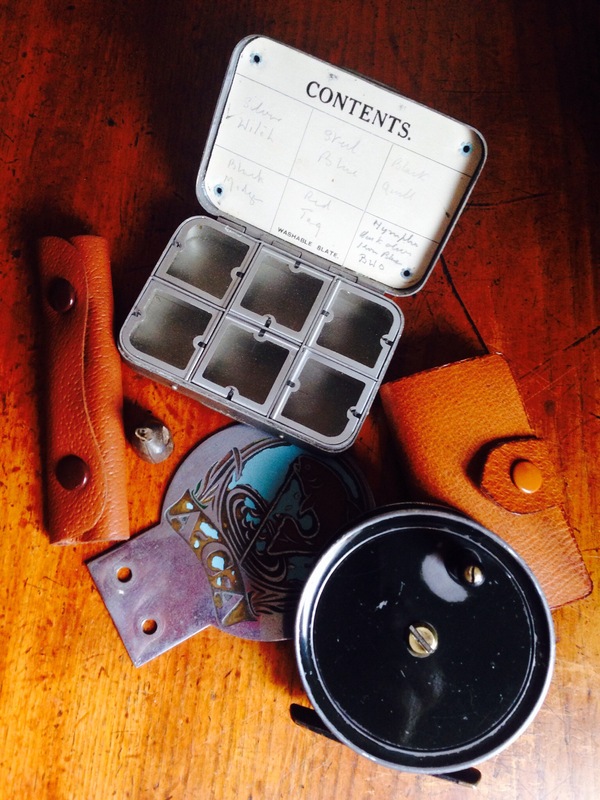 Found on the outskirts of the City at a car boot sale not far from the Fullers Brewery a hoard of fishing items, these vintage floats, plummet and a Wheatley Silmalloy Fly Box were buried under piles of household cast-offs, fabric and bric-a-brac. 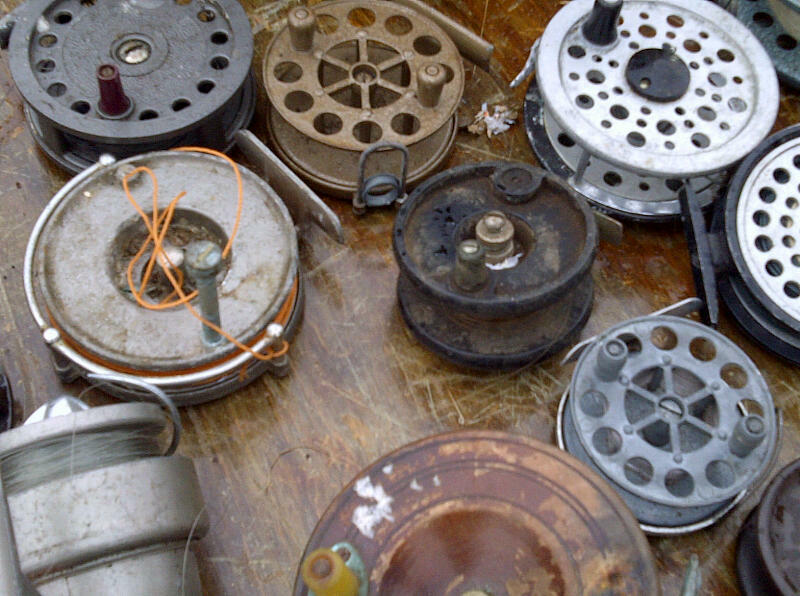 These vintage angling items will see the light of day and will be used once again. 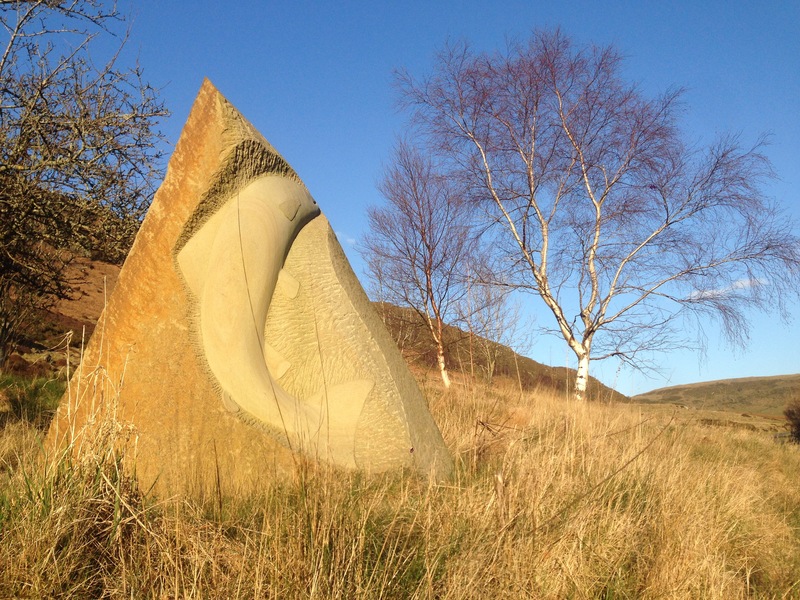 The Postman always rings twice…. One of the downfalls of living in London is that the kids steal the batteries out of the door bell, more for the hell of it than need. Our postman has got the plot that if there is a package to deliver he will usually knock twice in light that the door bell no longer works. Yesterday he delivered a fine Wheatley Fly Box full of well dressed Salmon and Sea Trout flies. 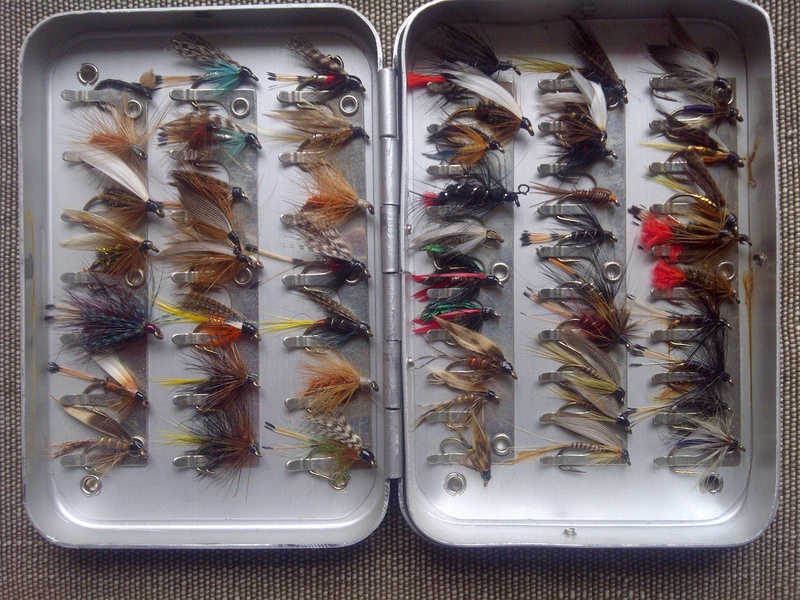 These flies were purchased in anticipation of a trip to Wales and the Tweed. On the note of the eggs in the Thames nothing was found today other than a few fragments of the outer ceramic casing, a broken oar with a red and yellow blade and a Rhino bin full of water, these were the only thing of note washed up on the shore today. 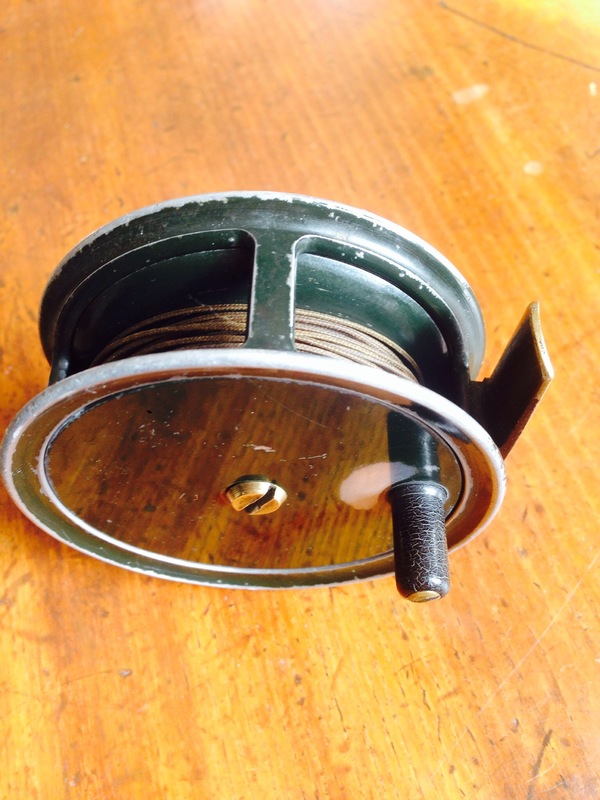 On eBay today I saw a Hardy waistcoat magnifying glass sell for £64, a Hardy waistcoat Dry Fly Oil glass bottle for £445, a Hardy LRH Lightweight reel changed hands for £153 and a Hardy Princess reel for £125. The name Hardy of Alnwick is commanding good prices it seems, especially for rare items. Hopefully tomorrow I will receive some floats in the post, made by an artisanal float maker to a very high standard and to a custom design by Paul Daddy. Also there should be another box of flies by Hardy on its way, these come in an original 70’s Hardy’s plastic box and are smaller flies for the Tweed. As the rain is has set in for the day a trip down the Thames to Greenwich on one of the Thames Clippers can wait for a sunnier day. In place of that I have decided to spend the morning going through my fly fishing bags in order to sort of the numerous spools I have and sort through my collection of Wheatley Silmalloy fly boxes,where I know flies from last seasons outing where just put back randomly. 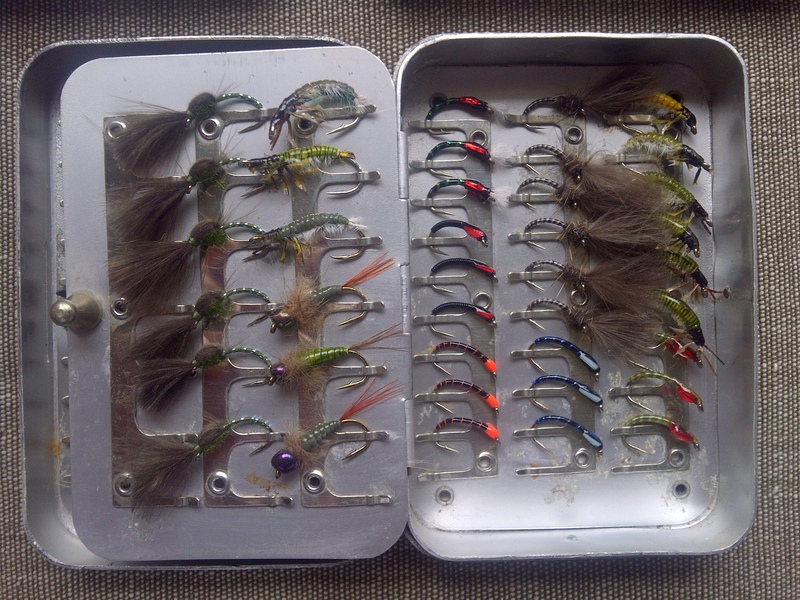 I usually store my flies in sets that match where I’m going to fish, so I have a box for flies for Welsh rivers and lakes, Hamphire chalkstreams such as the Itchen and Test, rivers such as the Tay, reservoirs like Blagdon and Chew and one box dedicated for salt water fly fishing for bass off the Sussex coast. In each box is a mixture of emergers, nymphs, wet and dry. I do however have a dedicated box of buzzers and nymphs and one just for dry flies. Like all fisherman I probably have too many, well that’s the comment my other half makes when I leave them lying around after a day out on the river, but can one ever have too many? 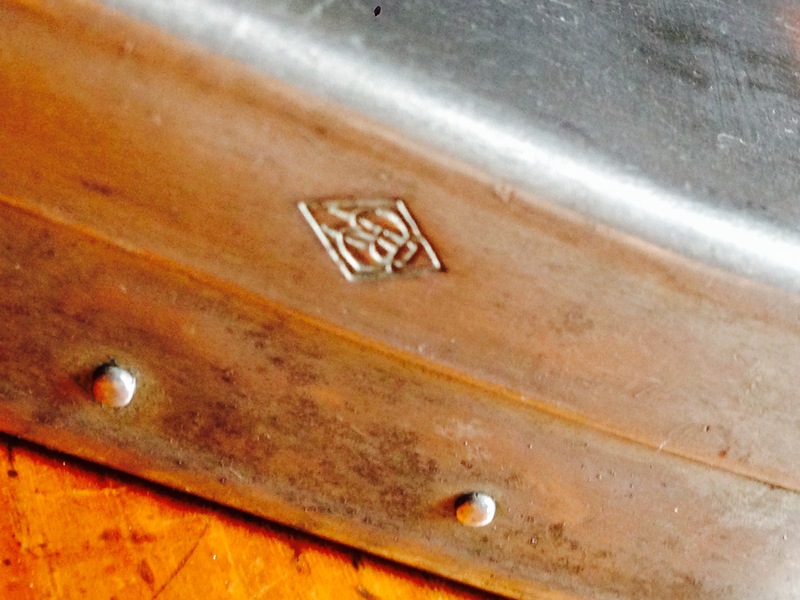 I have several Wheatley fly boxes and all of them marked differently with the Whealtley name or logo. 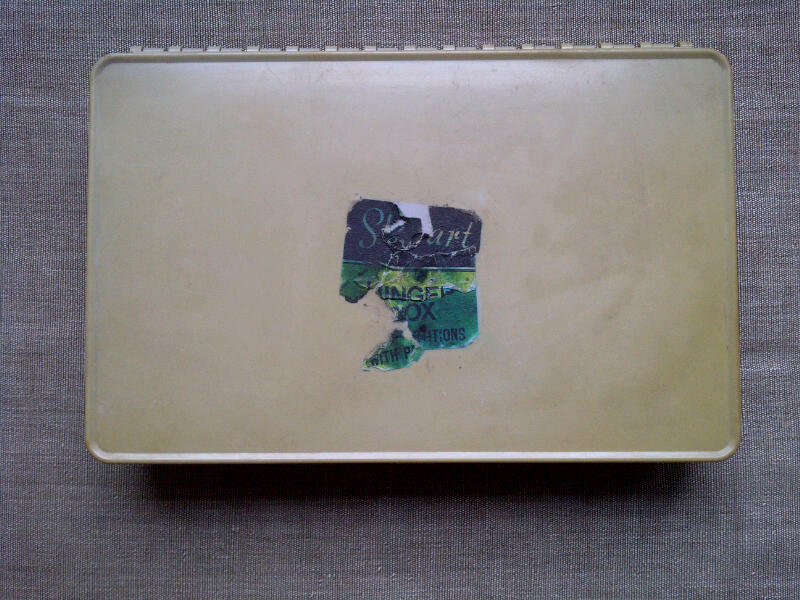 I also have a couple of Hardy branded boxes by Wheatley. As for spools, I usually have a couple to match each reel just so that I can change set up quickly to match the conditions when fishing. I usually have one set up with a DT floating line, an intermediate and either a sinking line or sink tip. I may also spool up one with a WF if having to cast in windy conditions. I would always recommend trying to purchase extra spools instead of getting another reel. Recently I picked up a couple of Hardy Marquis #7 spools with good quality lines on for £10 each at a car boot. In reality in a season I’ll probably catch most of my fish on half a dozen or so patterns, these being – pheasant tail nymph,GE nymph, black spider, olive buzzer, greenwells glory, grey duster, black gnat, grey or royal wulff, Elk hair sedge and a red tag for grayling fishing. If I’m fishing Northern waters then sparsely tied flies such as partridge & orange, snipe & purple and sherry spinner give good results for native brown trout. For reservoir fishing a traditional alexandra can give astonishing results along with a bustard & orange. One other fly to have is a wickham’s fancy especially foe fishing in the late afternoon or as the sun is setting. The main dealers had already been and long gone by the time the general public descend on Wimbledon Car Boot at Plough Lane. 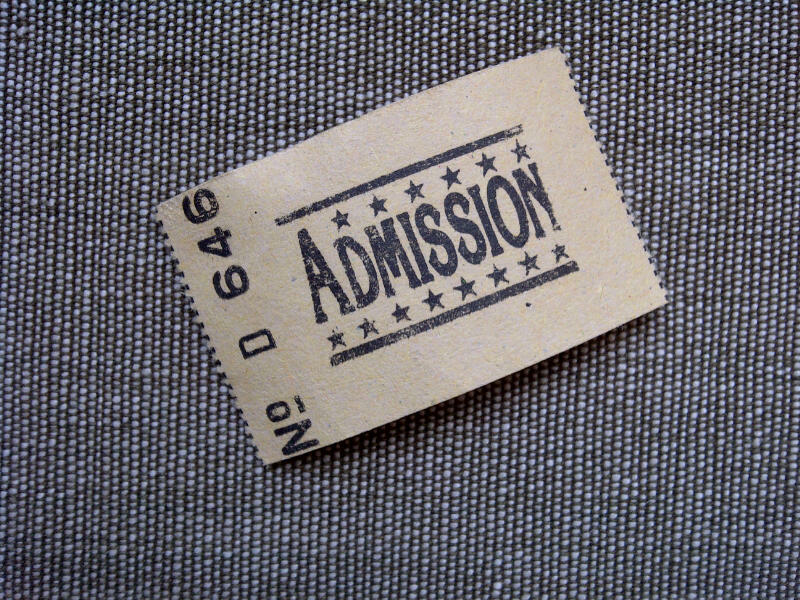 At 7.30am the public are allowed in but at a premium of £2 entry fee until 8.30 when it is 50p. With a sea of white, blue and brown vans parked in rows with the back doors open and their contents spread on pasting tables or just laid out on the ground, onlookers and collectors rifle through the boxes in search of bounty. 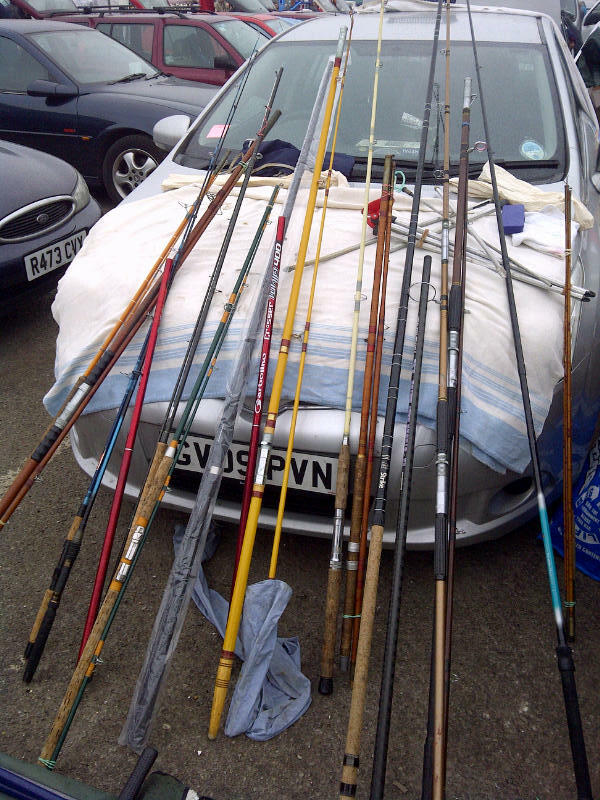 Found at the back of the car park were three stalls selling vintage tackle, one had a collection of rods from the 70’s and odd items for coarse fishing, the next had a few rods mainly cane and greenheart construction, some fly, coarse, spinning rods and an old Edgar Sealey of Redditch. The last stall had a large number of reels and spools some made by Hardy, Mitchell, Grice & Young of Christchurch, Hants, England and many unnamed. Also a table full of tackle boxes, several fly boxes and a couple of rods, one called Lucky Strike by Horrocks-Ibbotson Co. 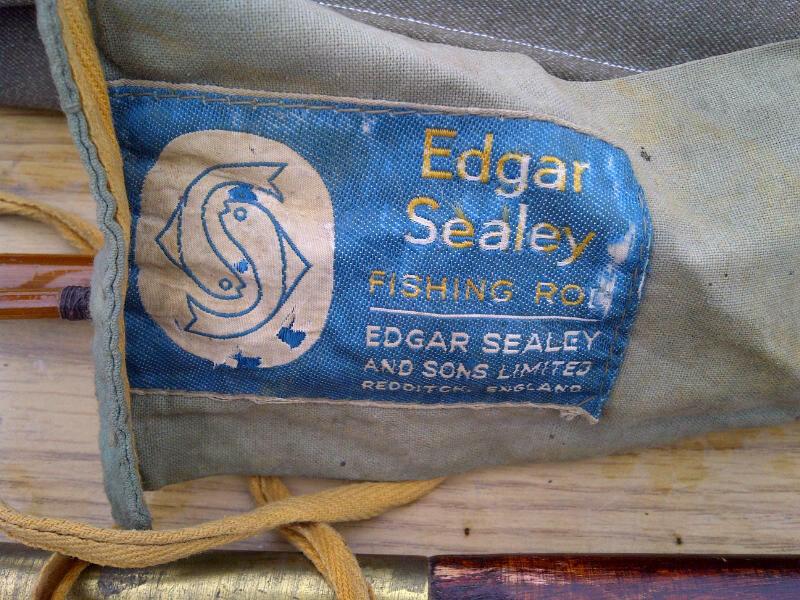 This rod I could date to 1933 from the decal on the rod. The only thing I acquired was a ‘Stewart Hinged Tackle Box’ with contents which included a few weights, some floats of which one was a Harcork in fine condition, 3 Abu Droppen spinners and 3 Devon minnows plus 4 soft squid baits which I can’t wait to use for bass fishing, the whole lot cost me £3, a real bargain.